The Particles Plus 2301-1 Remote Particle Counter measures 0.3 µm and 0.5 µm with a flow rate of 0.1 CFM (2.83 LPM). Integration is easy into a real-time monitoring or building management system via Modbus RTU or ASCII. The 2000 Series is the smallest remote particle counter on the market and has easy mounting options. The Particles Plus 2301 units comply with ISO 21501-4 and include a 2 year limited warranty. 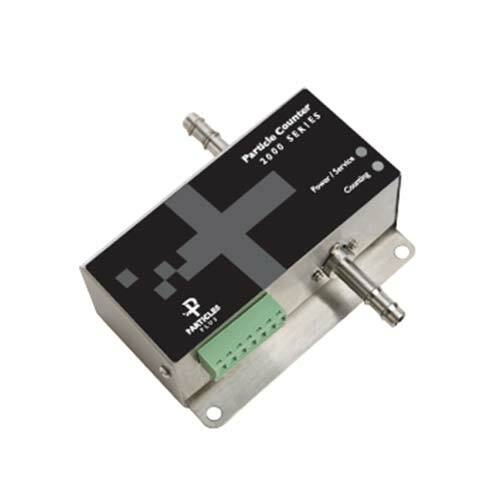 The Particles Plus 2301-4 Remote Particle Counter measures 0.3 µm, 0.5 µm, 1.0 µm & 5.0 µm with a flow rate of 0.1 CFM (2.83 LPM). Integration is easy into a real-time monitoring or building management system via Modbus RTU or ASCII. The 2000 Series is the smallest remote particle counter on the market and has easy mounting options. The Particles Plus 2301 units comply with ISO 21501-4 and include a 2 year limited warranty. Measures 2 channels of simultaneous data.